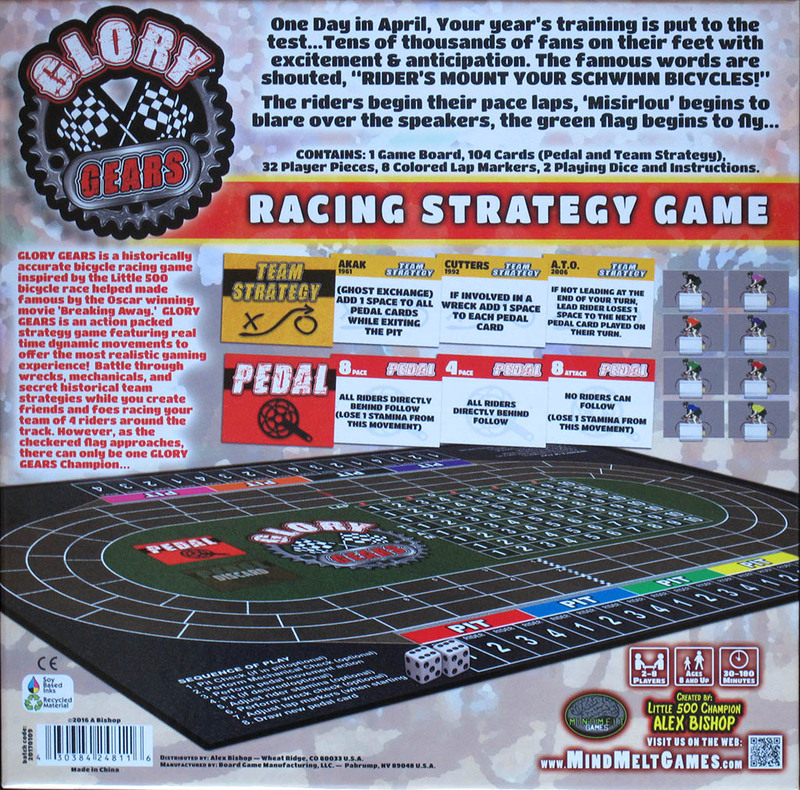 This game (released after a successful Kickstarter campaign) represents a little known amateur cycling race that takes place each year in Bloomington (Indiana)... Well that is what I thought, but I am afraid Il have to revise my concept of "little known", which just shows my ignorance. I just meant "little known in Europe". I quote from the wikipedia: "The Little 500 (also known popularly as the "Little Five"), is a bicycle race held annually during the third weekend of April at Bill Armstrong Stadium on the campus of Indiana University in Bloomington, Indiana. It is attended by more than 25,000 fans each April." Well, 25,00 thousand fans is not much compared to the Tour de France, but it is respectable quantity. In fact, some people claim that this race is the largest amateur cycling race in the world. That may be debatable but it is definitely not "a little known race". When I first read this game's rules (and found "pit checks" and "mechanical checks" in them) I thought that they were the rules for a car race game which had been adapted, for some unknown reason, to a cycling game. But then I understood that it is not the game, but the actual Little 500 race, which is modeled after the Indianapolis 500. The Little 500 was founded in 1951 by Howdy Wilcox Jr., Executive Director of the Indiana University Student Foundation, who modeled the race after the Indianapolis 500, which his father had won in 1919. This explains it all. Furthermore, Alex Bishop, the game designer, won the Little 500 in 2007 with his team, the Cutters (racers compete in teams of four, racing relay-style for 200 laps -50 miles- along a quarter-mile track) so he probably can tell the difference between a cycling race and a car race! The game is designed for 2 to 8 players. The movement of the riders is determined by cards (which I have often said is my favourite option for cycling games). 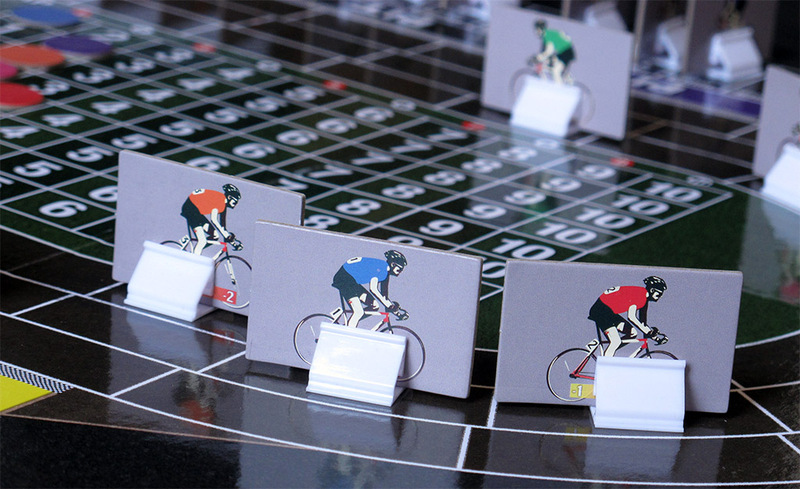 There are two dice included in the game but they do notr affect the riders' movement but rather the chances of suffering a wreck. There is a simple set of "beginners" rules and some advanced features in order to have a much realistic (and longer) play experience. These include bike mechanicals, wrecks, dropped exchanges, secret historical team strategies (! ), to even playing out the entire spring series races, which includes four additional racing formats. 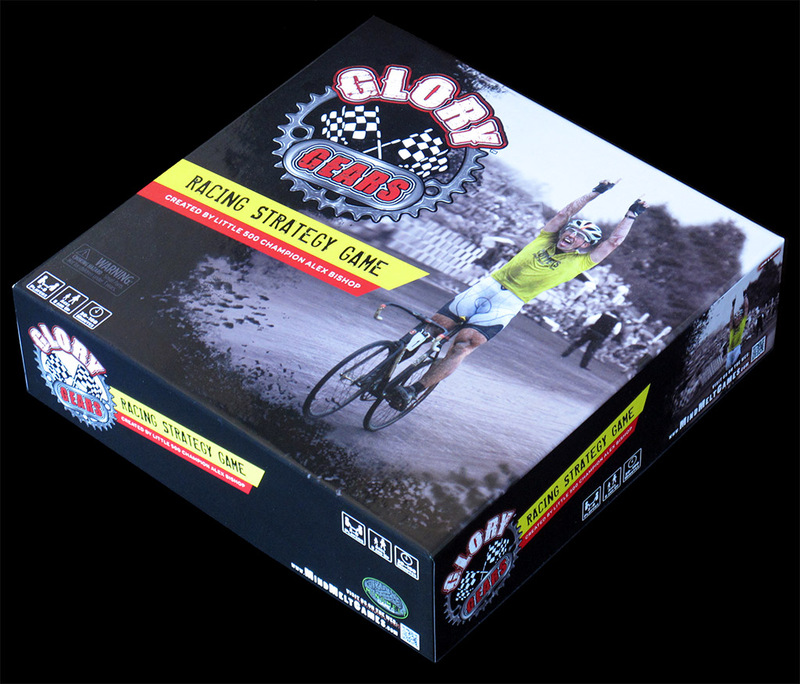 As Alex Bishop himself writes, "this game is designed to ignite the same inspiration, camaraderie and winning memories for board game players as the elation experienced by winning the cycling event". Nice words, but of course it is sooner said than done. You can download the complete game rules here and have your own opinion. The little numbers (-1 and -2) on the riders wheels (partially or totally hidden by the white plastic base) mark the riders' stamina. When they are too tired they must stop and have a fresh rider replace them. In the picture below the stamina points can be seen more clearly. By the way, I feel that the rules are not 100% clear on this point (or is it me? ), but that will not prevent you from playing the game. As I said above, the movement of the riders is determined by cards. There are 80 movement cards (with the red back). Players have 4 cards in their hand and, basically, play and draw. In between they perform (optionally, depending on the rules level) pit, mechanical and wreck checks and stamina adjustment. The top corner of each card will have a number 4 through 8. This is the number of movement spaces your rider can advance if played. In the center of the card is the type of movement. There are two types of movement, PACE and ATTACK. If you play a PACE card, all riders directly in the space behind your rider and all following in the same lane, will immediately draft and follow this movement. If you play an ATTACK card, no riders will be able to draft and follow this movement. 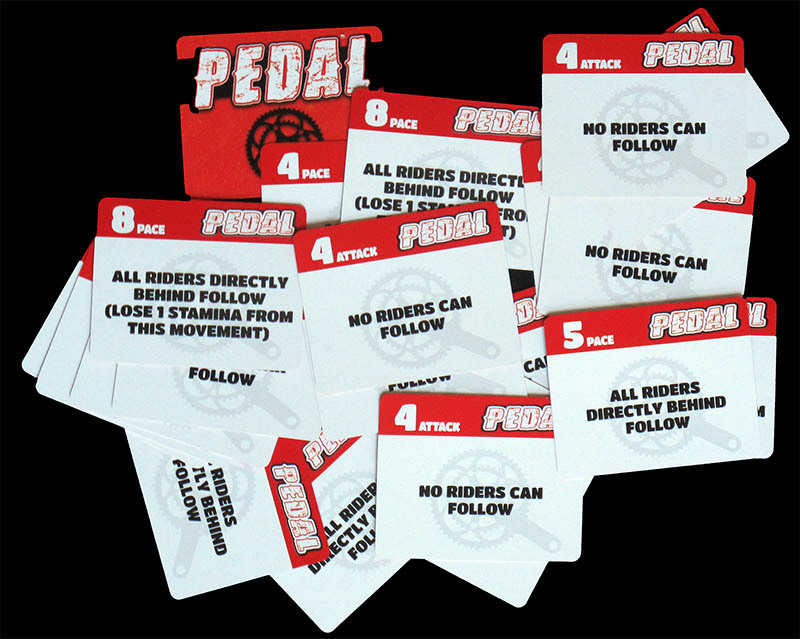 All 8 movement pedal cards will use that rider's stamina and make that rider slower in the next turn and through the end of game. 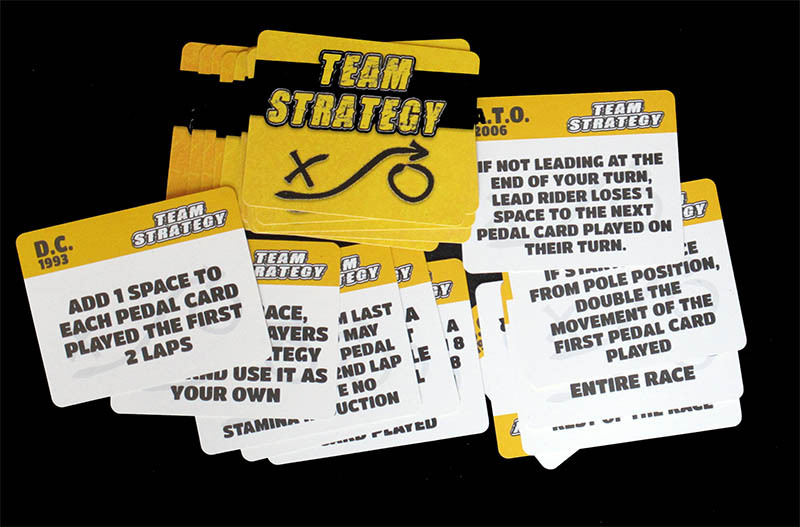 One unusual feature of this game are the Team Strategy cards (yellow back) which feature "secret historical team strategies". Each player draws 3 team strategy cards. 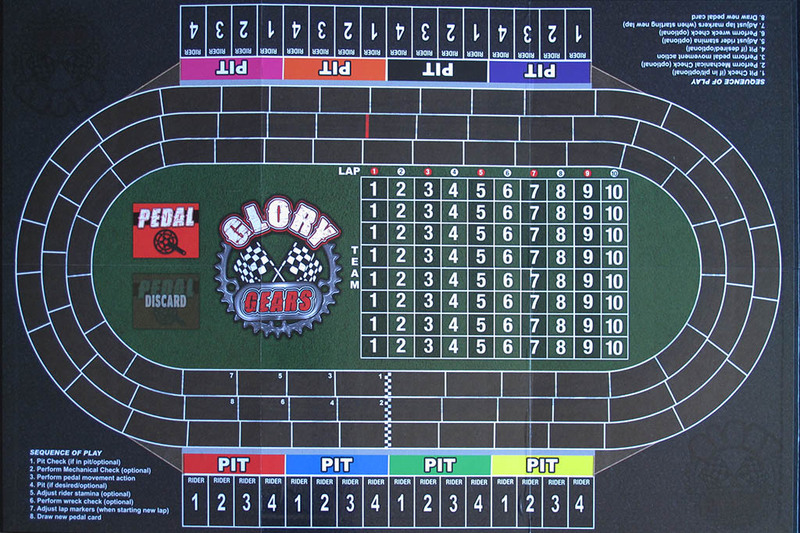 Each player must choose 1 card to use for the race and must discard 2. Each player keeps team strategy hidden and faced down. 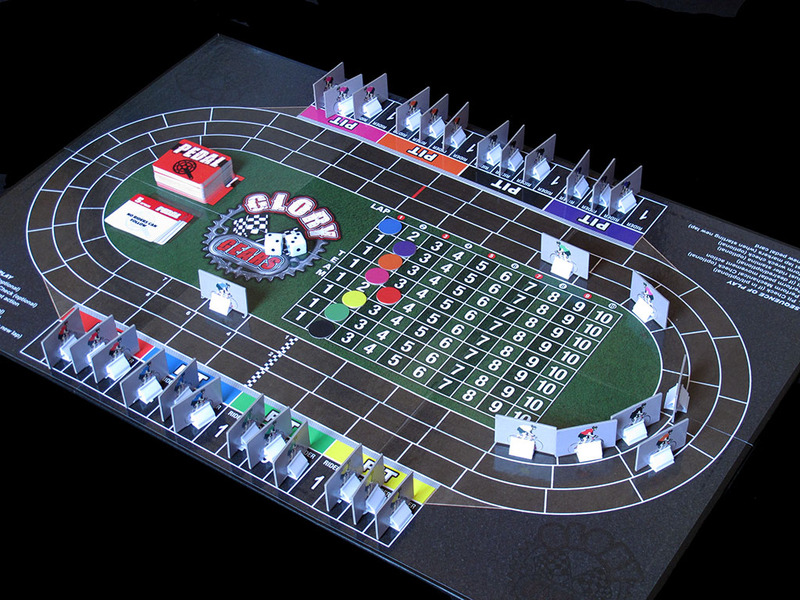 The card can be used and turned face up as soon as it is able to be applied in the race. The Little 500 is the race that inspired the 1979 oscar-winning movie Breaking Away (5 Oscar nominations, best screenplay award for Steve Tesich, a former Little 500 winner). If you prefer actual races to Hollywood movies, you will find a huge amount of footage on You-Know-Which video website. You can watch the complete 2007 Little 500 here (almost three hours!). If you are not willing to spend three hours of your life watching an online video, you can see a 90-second post race recap (including an interview with Alex Bishop himself) here. By the way, the Cutters only finished third in the 2017 edition of the race. This is the kind of game that I would love to play with the game's creator. I mean, all the games are better when played with their creator, and I have played some (including playing Homas Tour / Um Reifenbreite with Rob Bontembal, which is probably one of the highlights of my career as cycling games expert) but this one, since so much has been put in it to create the race's ambience (and since I know so little about the race), is one of those I would really like to play with the designer. Alex, when are you travelling to Europe?